Coral calcium is extensively used for its therapeutic benefits and medicinal value in ayurvedic medicine. Praval is the name given to coral in Hindi and in ayurveda. However, coral calcium powder is not used directly in ayurveda. Coral calcium powder is processed with edible rose water and ground to make a micro-fine powder. The coral calcium powder processed with rose water is known as Praval Pishti. Praval Pishti/bhasma (Coral calcium) is beneficial for bleeding disorders, calcium deficiency, non-productive cough, general debility, headache with burning sensation, acidity, gastritis, ulcer, ulcerative colitis, hepatitis or jaundice, sour vomiting, conjunctivitis (red eyes) and burning sensation in urine. 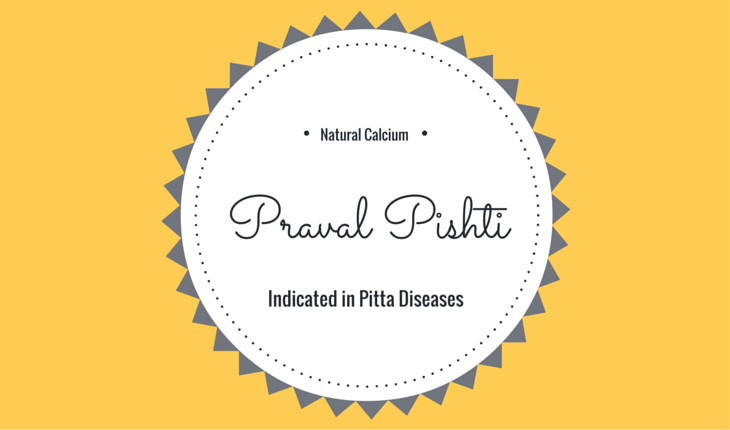 Praval Pishti contains 100% natural coral calcium processed with rose water. Coral calcium is good source of Calcium Carbonate (CaCO3). It also contains magnesium and trace minerals. However, coral calcium has chemical similarity with bicarbonate, but due to trace minerals, its chemical structure is similar to the human bones. Praval Pishti (Coral calcium) has following healing properties. Praval Pishti (Coral calcium) is helpful in following health conditions. Praval pishti or coral calcium is useful in diseases in which people experience heat or burning sensation in any part of the body or in the whole body. It reduces heat in the body and lowers the elevated body temperature in fever. In fever, it works in similar ways as Acetaminophen works. It reduces fever by acting on temperature centre in the brain and producing coolness in the body. Its intrinsic nature is cold, which means it brings coolness in the body after eating it. Its visible cooking effects can be experience after 2 to 3 hours after its intake. As per health conditions described in above therapeutic indication heading, it is beneficial in all these diseases and symptoms. It reduces fever, bleeding, coughing and increases bone mineral density, physical strength and calms the mind. Now, let us discuss main medicinal uses of Praval Pisthi as per ayurveda. In ayurveda, Praval Pishti is only potent antipyretic medicines. It has better results in lowering body temperature than Godanti Bhasma does. Its effects are visible about an hour after its intake in therapeutic dosage. People taking Acetaminophen can just lower the body temperature, but they still feel weakness, restlessness, lack of interest and loss of strength. It does not occur with Praval pisthi. It reduces fever as well as symptoms of fever including heat or burning sensation, excessive thirst, excessive perspiration, insomnia, vertigo, restlessness, loss of strength and weakness. In general fevers, it can alone work without any other medication. In most cases, people experience fatigue and tiredness after chronic ailment or infection. This condition is medically termed as Post Infection Fatigue Syndrome. Praval Pisthi is highly beneficial for reducing this type of fatigue and tiredness. It also reduces body ache and general weakness that occurs after infection. Praval Pishti is a natural source of minerals required for the treatment of Osteoporosis. Calcium in the Praval is highly bio-available. In addition to Calcium Carbonate (CaCO3), it also contains magnesium and other trace minerals, which helps in the formation of bone. In Ayurvedic Medicine, Praval Pishti along with Cissus Quadrangularis, Ashwagandha, Abhrak Bhasma, Mukta Shukti Bhasma, Godanti Bhasma, Kukkutandatvak Bhasma, Yashad Bhasma, Arjuna and Amla is helpful inducing the formation of the bone and strengthening bones, cartilages and joints. The dosage of Praval Pisthi (coral calcium) is 125 mg to 500 mg twice or thrice a day. The maximum dosage of prawal pisthi should not exceed from 2500 mg per day. However, raw coral calcium causes many side effects as given below. These side effects are not reported with processed coral calcium with rose water or Praval Pishti. Praval Pishti is LIKELY SAFE in supplemental as well as therapeutic dosage for most people. However, raw coral calcium might cause above side effects, so you should take it with caution. Ayurvedic physician regularly use processed coral calcium or praval pishti in pregnancy and breastfeeding. It is POSSIBLY SAFE under medical supervision. Elevated calcium level in the blood is the main contraindication of praval pishti or coral calcium. It can interact with some medicines, please consult your doctor if you are taking some medicines before using it. Excellent Jagdev Ji, thank you, and expect more, also the root cause of the disease’s. Sir I am going through perimenopause with increased body heat. Can I take Praval pishti before 1 week of my periods every month? The following combination will be the most effective for reducing body heat and other symptoms related to perimenopause and menopause. I have taken Praval pishti and Shatavari (dosage as above) for 1 month and I got very good result for my perimenopause symptoms. How long I can continue the same. As long as your body needs them, you can continue. Both remedies are safe for long-term use. My wife is 18 weeks pregnant. She has hypothyroidism. Can she take Trikatu Churna along with Praval Pishti? Is it safe? 1. Praval Pishti is safe. It is a form of natural calcium and it has better tolerance than calcium compounds used in allopathic medicine. It is also likely safe for pregnant women. 2. In Indian culture, pregnant women are already taking Trikatu in their food. Trikatu is a combination of three herbs – black pepper, long pepper and ginger. These herbs are common ingredients of Garam Masala. You have to buy weighing scale which measures in milligrams. It is easier available on amazon etc.